AWP? What’s that? My friends and family and anyone else I told about my weekend plans inquired into my LA trip plans. Well it’s a conference for writers, basically. I replied casually and coolly as if I wasn’t a newbie. Well, what do you do there? Uh, like, go to panels and stuff, and buy books. Writer things. I’ll admit, I had slight doubts about the truth of the last statement. Did I think AWP would be interesting? Enjoyable? Worth going to? Yes, yes, and yes. However, I wasn’t sure if it would be fun, per sé, in the sense of childlike amusement, easy-going, “relax and have fun,” fun. Boy, was I wrong. The conference was predated by a road trip, something I was a little nervous about in the beginning. I’m not good with long car trips (motion sickness), I do not pack lightly (fear of not having the right outfit for the right event is a legitimate thing), and I was travelling with two women I didn’t know really well (what do I talk about?!). However, within an hour of being on the road (and a Dramamine), my qualms melted away. We bonded quickly over shared ailments and McDonalds (oh, and of course what AWP panels we were looking forward to). Once arrived in LA, we got settled into the lovely JW Marriott and began our trek to the convention center, which overwhelming both size-wise and architecturally (there are just so many bars everywhere). We checked in, got our badges, and even pestered a security guard into taking our photo. 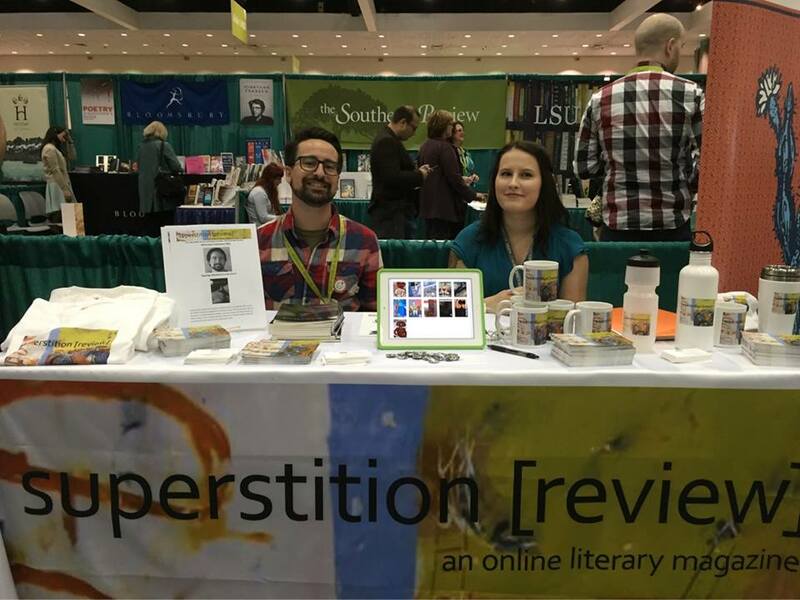 We were officially clocked in to AWP 16. The next couple of days would be, for lack of a better word, an experience. It may seem cliché, but I really did learn a lot about my interests, my long-term goals, and, most importantly, myself. I had the fantastic opportunity to become friends with and grow closer to my fellow interns (and roommates during the trip), Ofelia, Alexis, and Jess, who are all beautiful, intelligent, and incredibly talented women. I grew all the more appreciative of my internship with S[r] and of Trish, the most amazing mentor probably in all of existence. I also gained much knowledge about craft, met my favorite slam poet, Anis Mojgani, and came home with two tote bags worth of swag. You won’t go to all the panels you want to go to. In fact, after the first day, you probably won’t even try to go to all of those panels. That’s perfectly okay—you are human and you will probably be exhausted all week anyway. We are all taking a slight detour from real life to go to AWP, which is impressive enough, right? It’s okay to eat at some greasy chain restaurant the first night—don’t stress yourself out trying to find a Yelp-approved, hole-in-the-wall , unique restaurant. Sometimes you end up at a run-down Hooters at 10 at night, even in LA. You’re tired, you deserve wings and cold fries! If a panel takes a turn for the worse, don’t be afraid to skip out. AWP is about curating your own writerly education and if the panelists start arguing with each other about something completely off topic, well, you aren’t really learning anything are you? Social media, namely Twitter, is one of the best parts of AWP—see hashtags #badAWPadvice, #AWP16, and #overheardatAWP. Not only is social media great for building your brand (look at all I’m accomplishing, everyone) and interacting with big names/presses/magazines in the industry, but it also allows for some inside humor. Set aside at least 2-3 hours, maybe more, for the book fair. I promise it is worth your while to take your time and really pay attention to the books, magazines, contests, MFA programs, and so on that are all being offered. Don’t be afraid to talk to people at the tables either. We want to answer your questions and chat about you, your writing, and whatever else may come up. Also, if you are a poor college student, buying on the last day is a more financially viable option. Ask questions in panels and network (if you can) with the panelists, especially in career-oriented panels. Don’t be afraid that your question may sound dumb or that you’re hair looks wonky. There is no better chance to put your name in the mind of an editor than if you give it to them directly. Go to the AWP dance party and shake off all the stress from the day. Writers are great dancers! Also, it is free entertainment. Remember: you are a writer. Even in the midst of so many brilliant and successful people who have accomplished more than you, you are a writer. Don’t feel intimidated! AWP changed me, for the better. It reignited a lot of the passion I had lost for reading and writing over the past year (senioritis and personal life drama can really destroy your livelihood). I’m confident that its impact is similar on all attendees—after all, so many people continue to come back. If you’re interested in going, I encourage you to do it (and I’m not even getting paid to say this, so you know it’s a real sentiment), and if you have gone before, and will again, I will see you in D.C. Look for the dark-haired girl frantically searching for a Hooters. 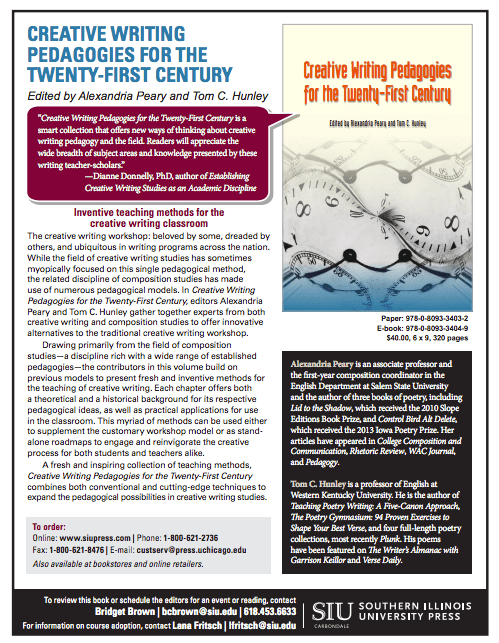 Congratulations to SR Contributor Alexandria Peary on the release of the book she co-edited with Tom C. Hunley, Creative Writing Pedagogies for the Twenty-First Century (Southern Illinois University Press). The collection offers new perspectives on old methods and guidelines on how to apply them in the classroom from 16 contributors. Alexandria’s creative nonfiction work is featured in Issue 12. 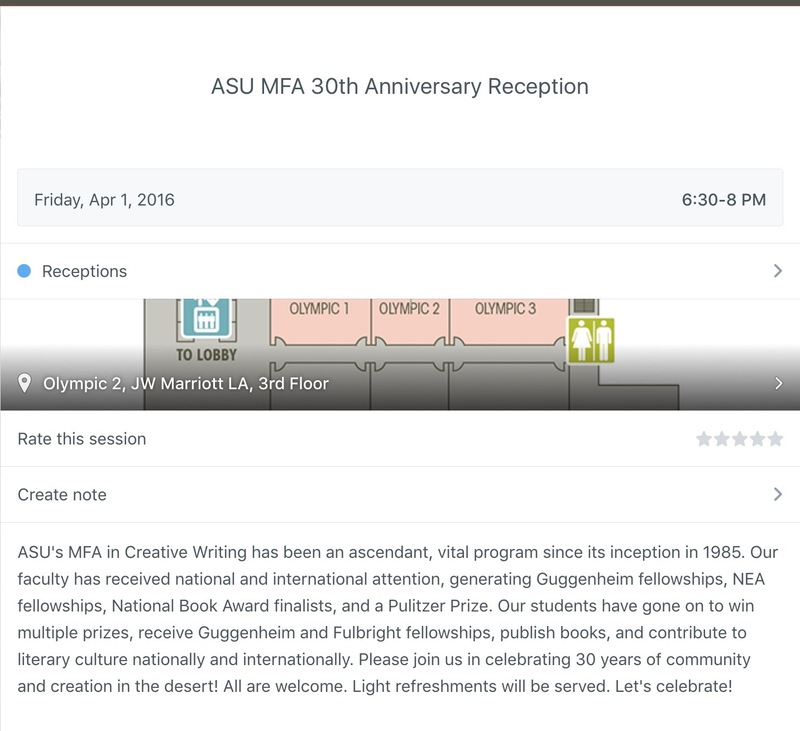 We hope to see you at the ASU MFA 30th Anniversary Reception at AWP Friday April 1 from 6:30-8 in the Olympic 2 room of the Marriott 3rd Floor. At AWP in Los Angeles this year, I’ll be presenting on a panel with Laura Valeri, Brendan Constantine, D. Period Gilson, and Zohra Saed that explores how brain science can help us in teaching our students about creativity. About a decade ago I developed a course on creativity for honors students at the Fashion Institute of Technology. We study theories about creativity and the imagination, personal accounts of the process by creators, and profiles of creative people over the centuries. Much of the research comes from the field of psychology, and recently the neuroscientists have weighed in. One of these, Dr. Shelley Carson, put brain science and creativity studies into a neat self-help package she calls Your Creative Brain (I’ve written a bit about this for The Best American Poetry blog). I’ve also recently had the chance to experience the creative process in a way I haven’t in a very long time. I am on sabbatical this semester, which means that for the first time in years, writing is actually my job. Because my last sabbatical was nearly 9 years ago, and I won’t have another one for at least 8 more years, I feel pressured to make the most of it. I have taken this very seriously and put several structures in place so that I can get writing done and avoid any of the pitfalls of procrastination, distraction, or general discouragement. For me, as for many others, accountability is key to productivity. During the month of February, I was part of a small group of women poets who made a pact to email each other a new poem every day. I missed a few days during the month for various reasons, but some of the group decided to go an extra week, so I did make my “quota” of 29 new poem drafts (it is a leap year, after all). You must understand how miraculous this is—I have written more poems in the past five weeks than in the previous five years. Despite other obligations (solo parenting two teens, one with special needs, an online class I’m teaching, other professional commitments), I have made writing a priority most days. Clearly, my plan is working. The phrase “the cave of making” has floated into my consciousness from time to time when I think of this immersion in the process, and especially when I imagine describing my activities to someone else. If anyone asked what I was up to during my sabbatical, I would reply, “I am in the Cave of Making” in capitals or hushed and reverent tones, surely inspiring awe in my audience. No one has asked, excepting a few texts from friends, but even within my own personal echo chamber it seems an appropriate term for the angst and groping in the dark, the moving around in one’s own sweat and exhaust. I wasn’t sure where the expression came from—something I read during graduate school, or perhaps a creativity book by Natalie Goldberg or Julia Cameron, or maybe a Jungian image from Robert Graves or Joseph Campbell. I was surprised, then, when a quick Google showed it actually came from one of my old poetic familiars, W. H. Auden. “The Cave of Making” is the title of a poem from Auden’s sequence About the House, about his home in Austria in the early 1960s. Rather than the metaphorical realm I had conjured up, he was literally describing his study, the room of the house where he composed and revised. Because I compose in several places—my dining room table, a cubicle at Paragraph, a shared workspace for writers in Manhattan, or at various cafes in the city—the cave as metaphor will have to do for me. And it is an apt one for writing—there is a certain amount of searching and digging to be done before you can gain entrance, and you never know what you’ll find as you creep further down and in with your puny lantern. This spelunking is not for the faint of heart or easily discouraged. It requires a commitment of time and focus and a promise to return to the site regularly, if not daily. It requires letting go of expectations about the outcome and being open to whatever you find. Some days it is Happy and Dopey in the Disney diamond mines, full of song and slapstick; others, it resembles modern extraction of precious metals, requiring the force of rock-crushers and earth-movers, and when the boulder is finally pried away from the cave’s mouth, all manner of bats and dust and foul gases fly out. I’ll be doing what I can to infuse my presentation on the creativity panel with these discoveries, as well as what I’ve learned from guiding my students on their own excavations. My other duties at AWP will be chairing the annual meeting of the Art School Writing Faculty Caucus, an organization of writers who teach at art and design schools who gather to share best practices and discuss concerns particular to those institutions. Founded by Hugh Behm-Steinberg of the California College of the Arts, the Caucus has a growing constituency and we are in the process of adopting bylaws, electing an Executive Board, and generally becoming a more solid presence within the AWP. I know that being at the conference will inevitably produce “AWP Brain,” that state of mind where input can lead to sensory overload and require much time afterwards to process it all. Thanks to the folks at Superstition Review for giving me this space to chat about the creative process here in preparation for these events! The panel “We Don’t String Popcorn Necklaces Here: Brain Science and Assessment Beyond Craft” occurs at AWP on Saturday, April 2 from 9-10:15 AM in Room 512 at the LA Convention Center. The Art School Writing Faculty Caucus Meeting will be held Friday, April 1 from 6-7:15 in Room 412 at the LA Convention Center. This year I’m on an AWP panel called “The Poem You’ll Write Tomorrow: How to Teach Vision.” Now I can’t tell you what that poem is, so let me talk for a minute about the you who is going to write that poem. My topic is the mind of the poet, but I’m really taking about the mind of anyone who wants to be original and creative. The mind of the physicist and the chef and the cinematographer are all one mind. You have the same mind they do; it just happens that you write poems. At my university, I belong to a group called the Lawton Professors. These women and men are from every field possible: chemistry, psychology oceanography, computer science. I’m the only poet, though there is one dancer. When I look at the Lawton professors as a group, my hypothesis is that they all share a condition called hypomania. As the name suggests, it’s a low form of mania. And it stays there; it never sinks into depression, nor does it soar into the kind of enthusiasm that gets you into trouble. There’s a recent book called The Hypomanic Edge by John Gartner, a professor of psychiatry at the Johns Hopkins School of Medicine who says that, for better or worse, American energies are hypomanic; the original European settlers had to have confident curiosity to sail across the Atlantic in leaky wooden boats, and every day people come to this country who are confident that they can make a better world for themselves. Now let me see if I can relate all this to the world of poetry while keeping it scientific. John Keats trained as a surgeon-apothecary, which means that, if he hadn’t died at the age of 25, he would have been a sort of nurse-practitioner, possibly in a small town that had no doctor. One of his teachers was the surgeon Sir Astley Cooper; there’s a procedure involving the ligation of the external iliac artery that is named after him and that any surgeon will tell you about if you ask him is he’s ever heard of Sir Astley. So at the AWP panel on vision, I’ll be talking about what you can do to be more of a hypomaniac than you are already. I’ll be using lots of examples: poems, of course, but memoirs, fiction, biography, even sculpture. And I’ll be fast. I’m on the panel with three brilliant women–Traci Brimhall, Natalie Diaz, and Erika Meitner– so what I really want to do is say my piece quickly and then listen to them. 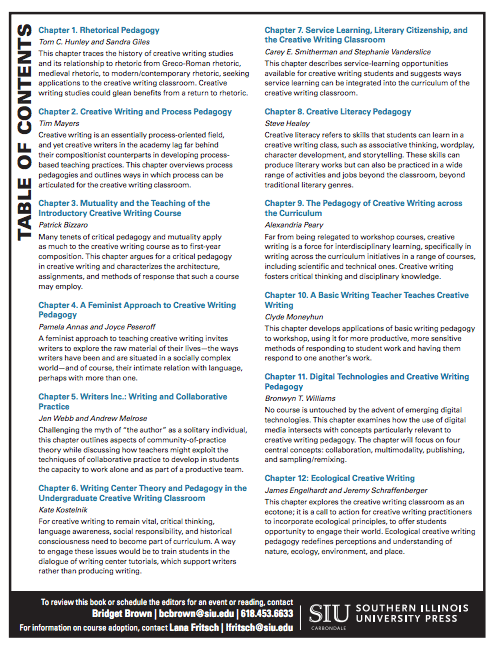 Pedagogy is deeply important for creative writing for a reason beyond teacher professional development or the legitimizing of creative writing as an academic discipline. While pedagogy certainly helps in those areas, students are the main reason for its importance. Organized as it is around exchanging drafts (usually at a fairly advanced stage) and the giving and receiving of feedback, the workshop model makes certain assumptions about where the student is located in his or her writing process. Typically, the workshop model pays sparse attention to prewriting, early drafting, and the actual implementation of that feedback to revise. The workshop approach casts light onto a fairly limited stretch of the writing experience, leaving radio silence before and afterwards. someone who’s sitting in a classroom. One of this year’s AWP panels on pedagogy, “Creative Writing Is for Everyone: Pedagogies for the Twenty-First Century,” strives to dismantle these assumptions. The five panelists present a sample of pedagogies from the 2015 collection Creative Writing Pedagogies for the Twenty-First Century (Southern Illinois University Press): Steve Healey, Tom C. Hunley, Tim Mayers, Stephanie Vanderslice, and Alexandria Peary (moderator and presenter). Panelists discuss service learning; process and rhetorical pedagogy; Creative Writing-Across-the-Curriculum; and creative literacy. creative writing can celebrate the writer of the unfinished as much as the writer of the polished product. This AWP session occurs at AWP on Friday, April 1, from 3:00-4:15 PM in Gold Salon 1, JW Marriott LA, First Floor. Copies of Creative Writing Pedagogies for the Twenty-First Century will be available at the Southern Illinois University Press booth. Southern Illinois University Press will be offering a 30% conference discount on Creative Writing Pedagogies for the Twenty-First Century to people who attend the panel and AWP; the promo code will be valid for 1 1/2 weeks after AWP.